We get a lot of questions and a whole lot of positive comments about just how well some of the amazing emulators run on the Nintendo 3DS with the R4 3DS card. We love our classic games here at R43DS.org and we know a lot of our customers do as well. Check out the video below by one of our previous customers showing the Neo Geo emulator on the R4 3DS card being played on the Nintendo 3DS system. Then read on below to find out exactly how you can play Neo Geo games on your own Nintendo 3DS. And if you have a DS or DSi console, with the R4 3DS you're covered there as well. So What will you need in order to start playing all of your favorite Neo Geo games on your Nintendo 3DS? You need just a few things to make this happen. First, you’ll need an R4 3DS card or a similar or comparable 3DS Flashcard. Without one of these, you won’t be able to use the emulator or the games you want to play. You need the R4 3DS in order to load the Neo Geo emulator on to it and the games you want to play. It is the quickest and by far the EASIEST way to play all of your classic Neo Geo games. The very next thing you will need is the NeoDS. The emulator is freeware and you can download it from our 3DS Homebrew section. NeoDS uses the Mame romset. What that means is that any Neo Geo AES or MVS game that works or loads in Mame, will load up and work just fine in NeoDS. The only thing you will have to do is use the included rom conversion tool and convert them all to the .newo format that is required by NeoDS. The software does this for your automatically once you're ready to convert the games. Download the NeoDS emulator pack from our homebrew section. When you download NeoDS you will download it in a .ZIP archive. You can use any ZIP utility like winZip, WinRar, or the freeware 7Zip. Windows also has an archive utility built in, that can extract .zip files so if you don't want to download anything you will be able to simply use that. Once you extract the archive you should see the files and folders below. Alright. Now that you're all set and have the archive uncompressed, let's get down to the really good stuff. NeoDS.nds is the actual emulator itself that you will run on your R4 3DS card on your Nintendo 3DS system. 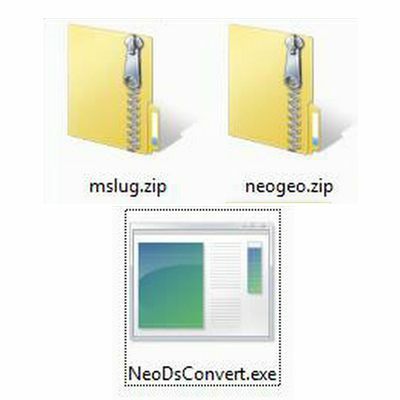 Along with the emulator you will so need the NeoDSConverter.exe file in order to convert your rom to the required .neo format required by theThere is also a special converter tool called NeoDSConvert.exe, which is what you will use to convert over the Mame Neo Geo Romsets to the NeoDS format. Now you will want to get the Neo Geo ROM files you want to use and play. The system rom (or bios as I call it) is usually named neogeo.zip and you will need this just to run the emulator and of course all of the games you want to play using the emulator. This is like your PC BIOS, that runs your PC and is needed… without it, you won’t be able to do anything. 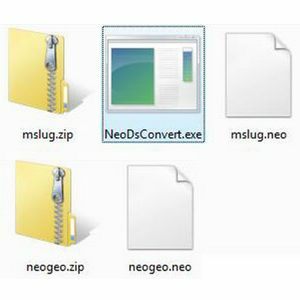 Lastly, you will need to use the NeoDSConvert.exe to convert your Neo Geo Game Roms over to the special format needed for NeoDS itself. Below I have put together a step by step set of instructions on just how you do this. You need to copy ALL of the game roms you want to use in neoDS into a single folder, including the neogeo.zip system bios rom as well. For example, if you have games like Metal Slug and Nam1975, they will probably be called mslug.zip and nam1975.zip Put all of your games into the same folder. NOTE: If you system rom is NOT named neogeo.neo then you will need to rename it to neogeo.neo in order for it to work. You also want to copy/move the neodsconvert.exe to the same folder as all of your game files. In Windows Explorer, execute (run, click on, whatever you want to call it) the neodsconvert.exe file. While it won’t show much on screen, the converter will actually convert every single zip file in that folder, to the special.neo format that you’ll need in order to play them on the 3DS. All of the games in that folder will be converted for you. You now have all of the games and system roms you wanted to use, in the same folder as your zip files were. What you want to do now is copy or move all of the files, including the neoDS.nds emulator, to the root of your micro SD card that you will be using in your R4 3DS card. The root refers to the very top level directory or folder. So don’t make a folder name NEOGEO and copy the files in there, instead copy them just to the root of the micro SD card. Once you’re done, take your micro SD, put it into the R4 3DS, and plug that into your Nintendo 3DS and power it up. You’ll be greeted with the R4 menu, where you can select the games or apps you want to load. 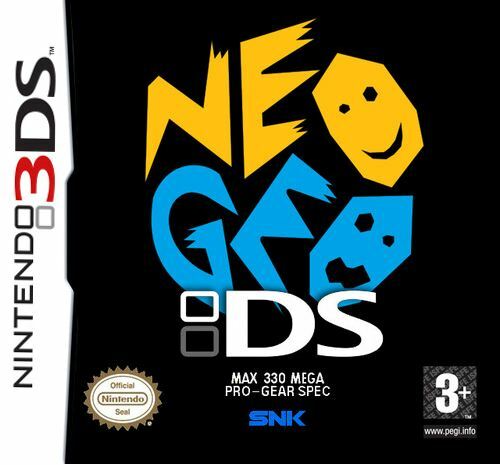 Simply load up NEODS.NDS, and you’ll see the familiar Neo Geo startup, and the option to load whichever game you want to play.